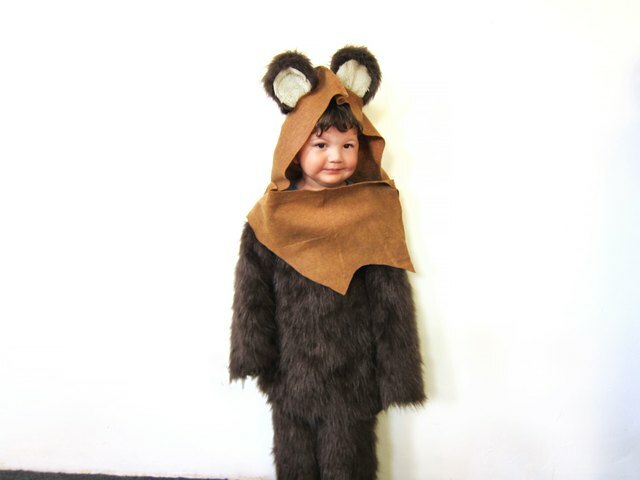 Darth Vader has mind control, Luke has the Force, and the Ewoks have… maximum cuteness. But if you thought these furry little creatures couldn’t get any cuter than they are on the big screen, think again. 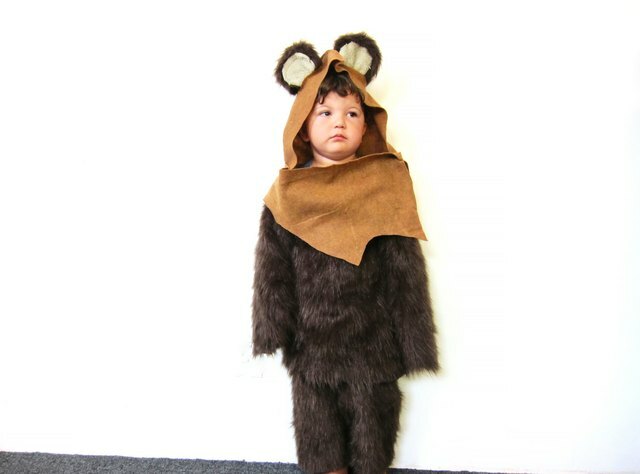 Drape your own little one in Endor garb and wait for the Jedi to return for smiles, laughter and plenty of candy for all! 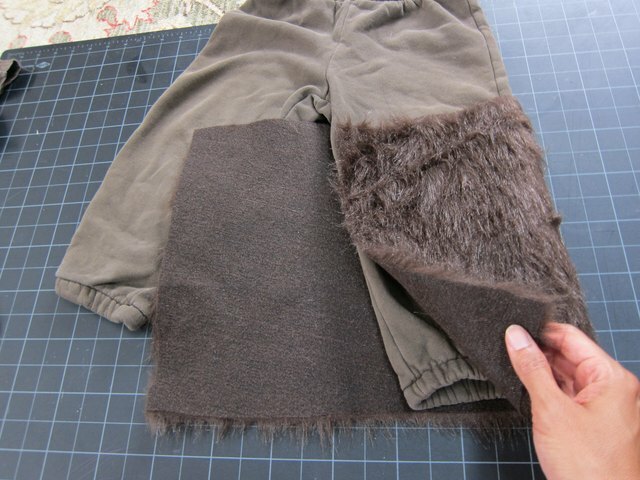 Right under the underwear line on the sweatpants, measure and cut a rectangle of dark brown faux fur large enough to wrap entirely around one leg. Repeat for the other leg. 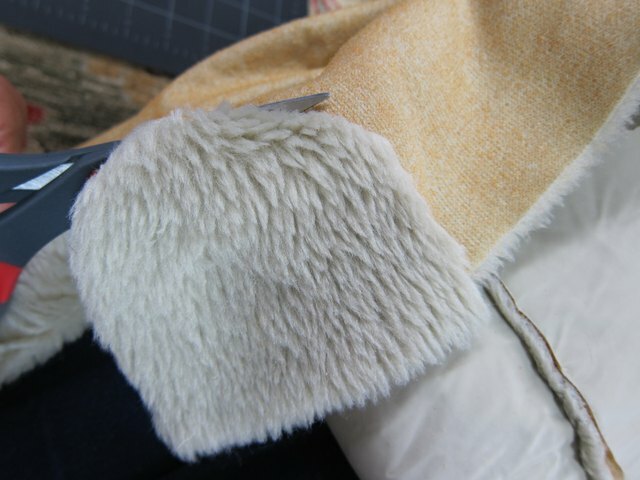 At the top of each rectangle, sew the fur to the pants, using a whip stitch, leaving an open seam along both inner legs. 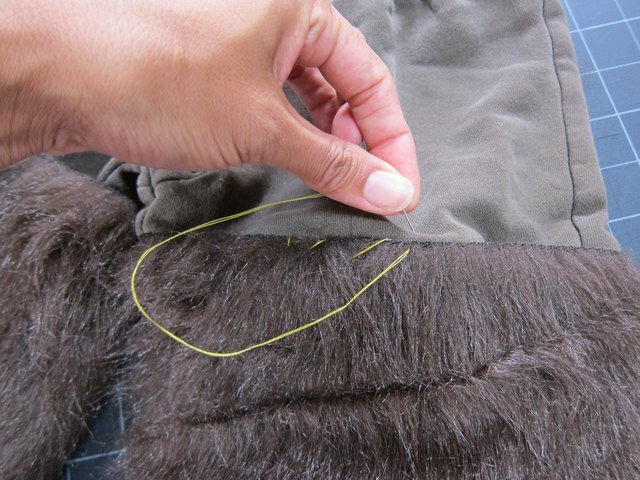 Sew the inner side seam of the fur leg to itself with a whipstitch. Repeat on the other leg. Wrap a dark brown faux fur rectangle around a long-sleeved T-shirt, positioned just below the armpits, and leave the open seam on the side. 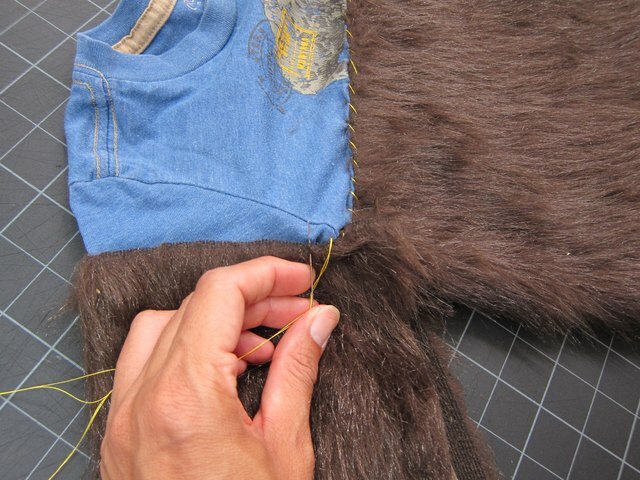 Sew the top and side of the fur rectangle in the same fashion as you did with the pants, whipstitching the top to the shirt and then the side to itself. You may want to leave the bottom 4 to 5 inches of fur open at the bottom to allow easier entry into and out of the shirt. 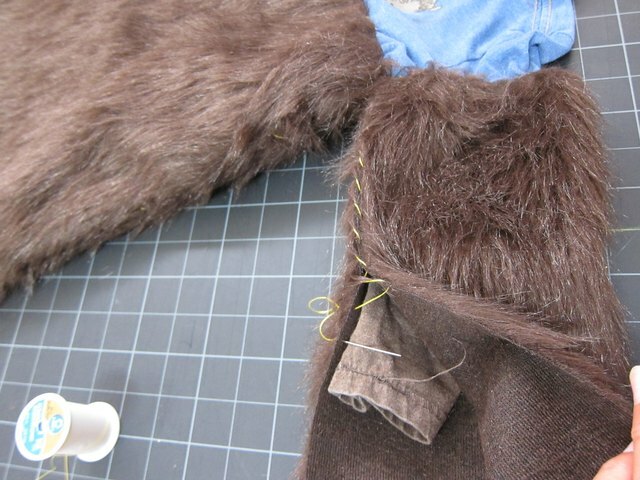 Wrap a dark brown faux fur rectangle around each of the arms, sewing it first around the diameter of the sleeve, then whip-stitching it to itself from armpit to wrist. 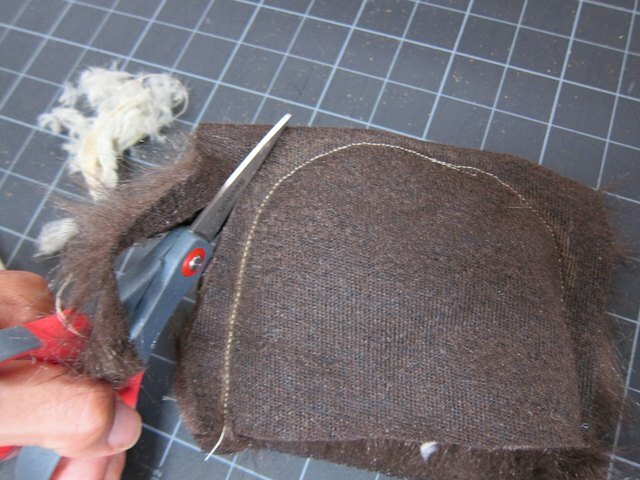 Take a hooded sweatshirt or jacket that you already have and trace the outline of the hood on two layers of brown felt, leaving about 1 inch of extra space around the outline. Cut out both pieces of felt following the outline of the hood. Cut the bottom of the two felt pieces so they dip down in the back. 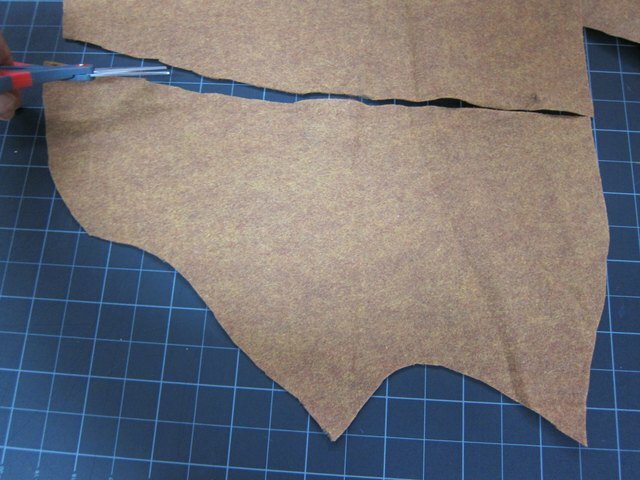 Cut another piece of brown felt, as shown in the image, in a wavy continent-like sort of shape, measuring 17 inches wide by 10 inches long. 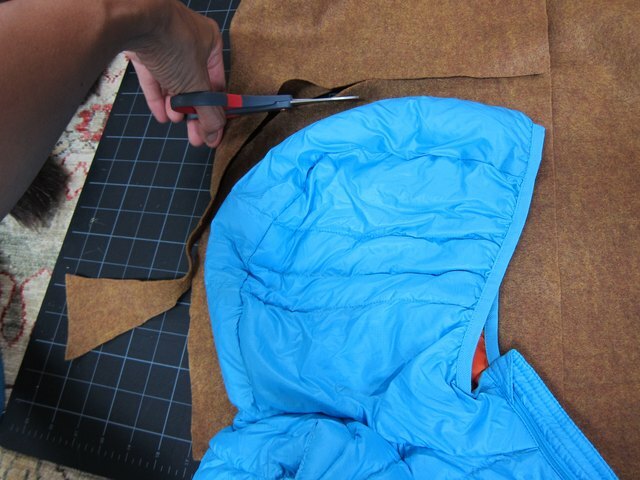 Sew the two side pieces of the hood together, and then sew one end of the smock to one side of the hood in the front. 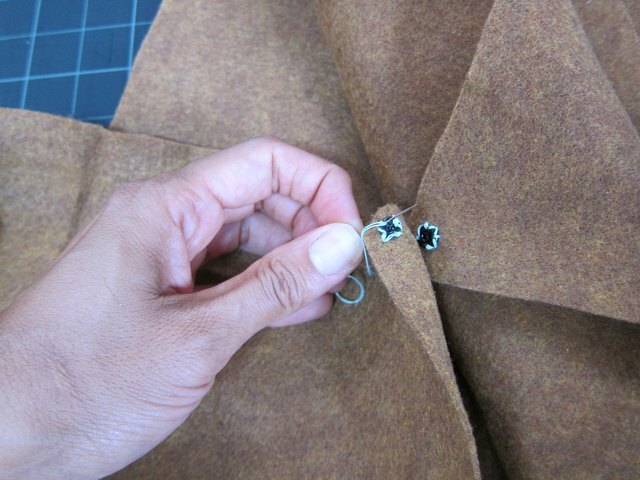 Sew a snap or hook-and-loop fastener to the other side of the hood, and sew its adjoining piece to the loose end of the smock. 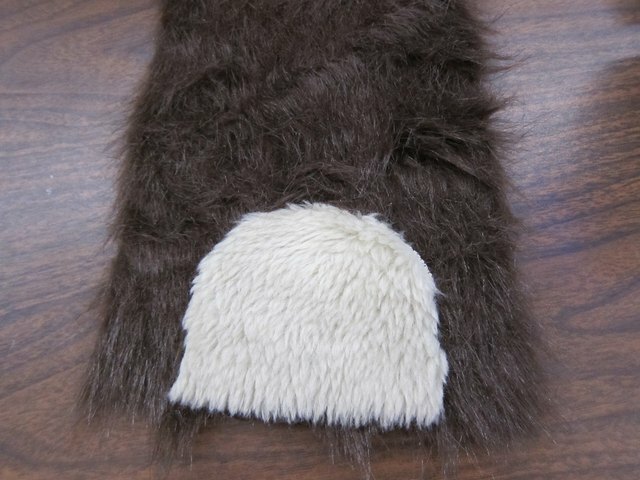 Cut two 3-inch-by-3-inch squares from light brown faux fur for the insides of the Ewok ears, and then round the top two corners. 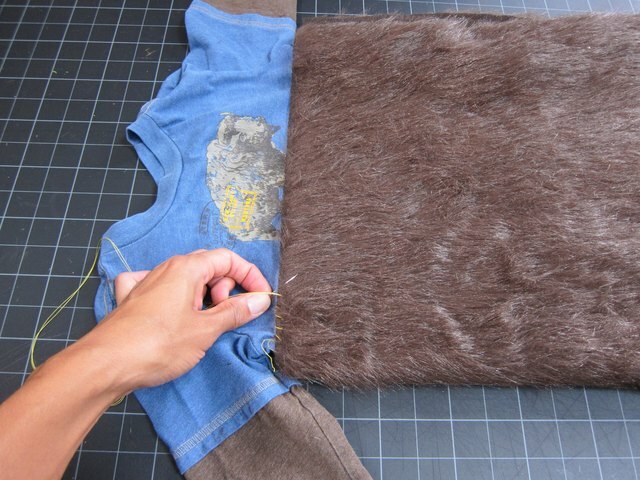 Cut 10-inch-by-5-inch strips of dark brown fur. 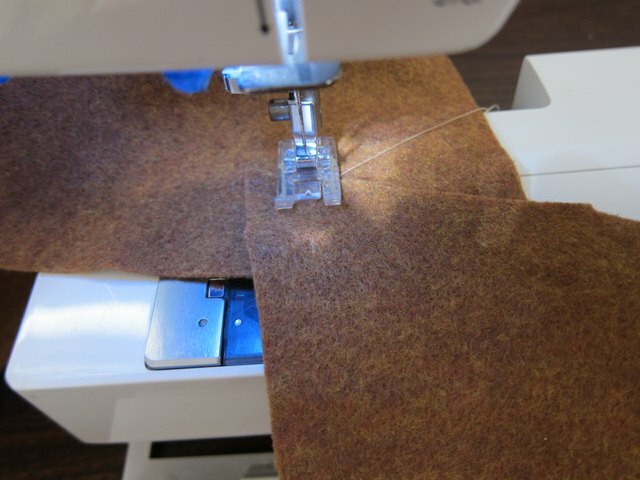 Sew or glue one of the rounded light brown fur shapes to one end of the dark fur strip, centering it. Repeat on the other fur strip. Fold the strip over inside-out. 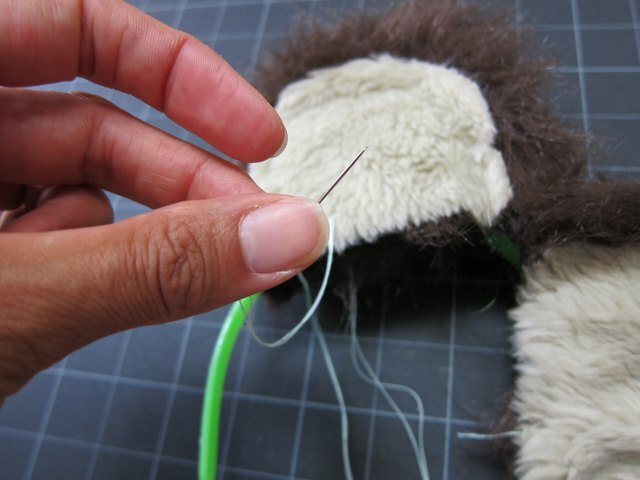 Sew around the rounded portion of the ear, an inch outside the inside ear, and cut off the excess. Do not sew the straight portion of the ear. 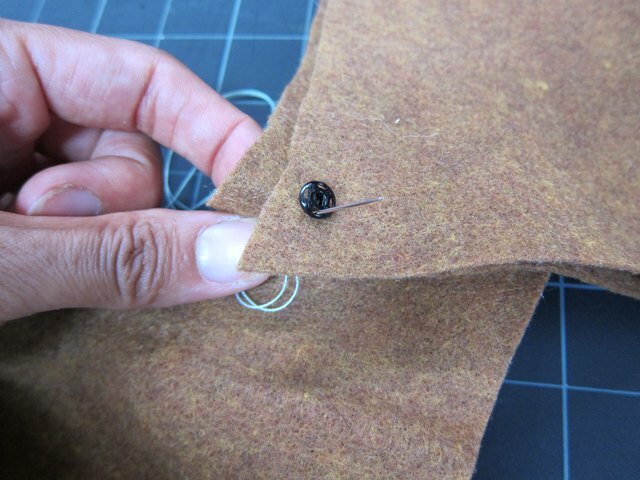 Place the opening of both ears over the antennas and hand sew them closed using a whip-stitch. Cut slits in the top of the hood large enough for the ears to stick through. 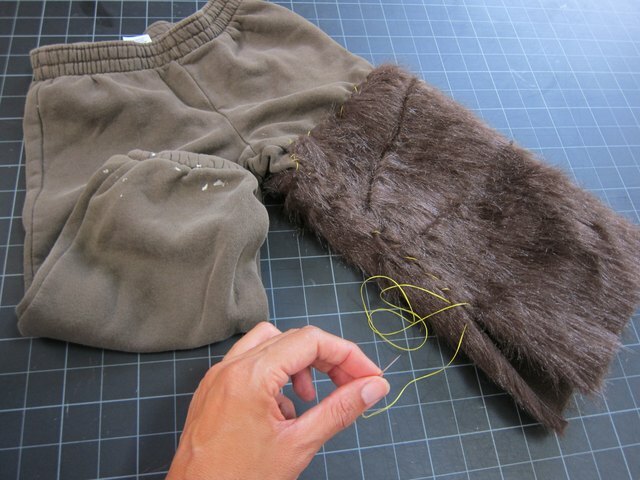 To assemble the costume, put on the fur-trimmed pants and shirt, the headband, and then the hood. Snap the hood and smock together and position the ears so they poke through the slits in the hood. 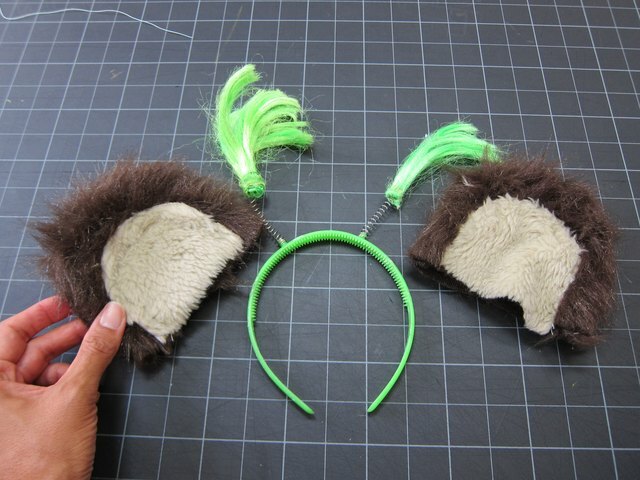 A tutorial on making a Yoda costume out of easy to find materials. This costume requires very basic sewing skills.